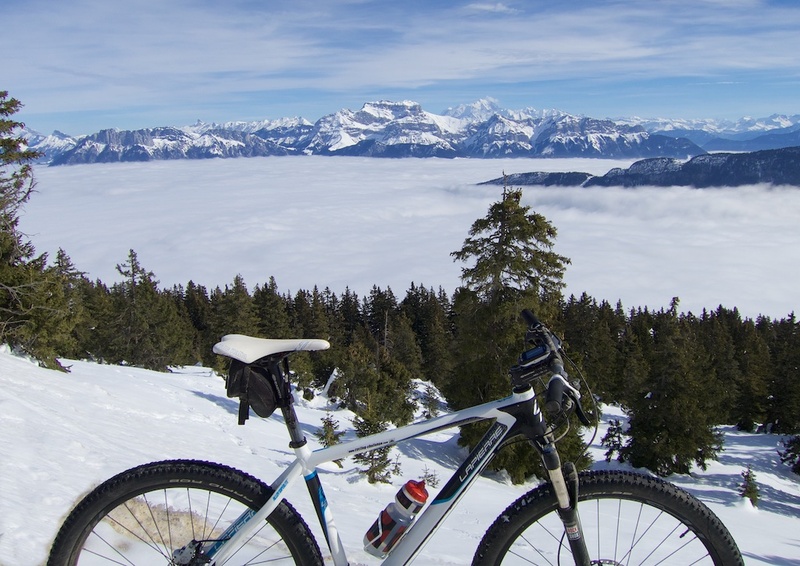 My plan was to cycle up the tough, north side, through the woods, starting from Annecy – and hopefully rent cross country skis at the summit. It was overcast down low, and I hoped to quickly get though and above the clouds, but it took me well over an hour to see the sun. I took a mountain bike but the road, while wet, was perfectly clear. 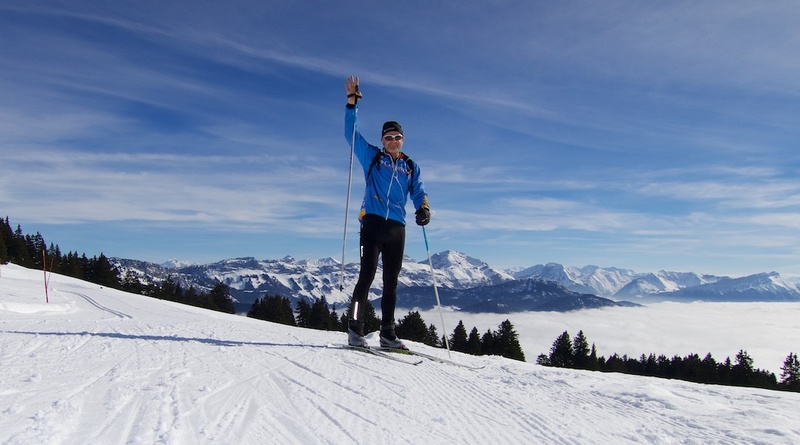 My first “bike-up, rent XC Skis” was at Col de Joux Plane last winter see here. At the summit is a small ski station – 18 downhill pistes. There are also 46 kilometres of cross country skiing trails (and plenty of snow-shoes trails). 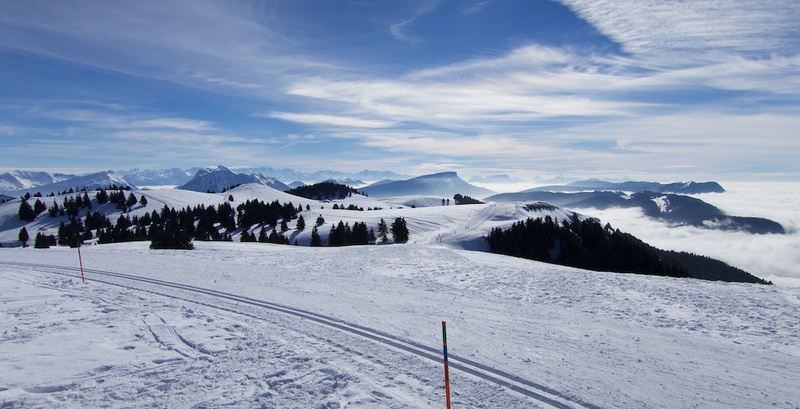 The cross country ski area is split into 3 areas – see here. I wandered into the restaurant at the summit and asked if rentals were available. Yes (!) – upstairs. The summit cross country ski sector has a Red (7.5 kms), a Blue (3.5 kms) and a small Green trail. Perfect. I rented equipment, decided I didn’t need my bike helmet, and managed a shortish but nice XC ski on tired legs: a red loop and a blue loop. The views are superb. Too much fun. After cross country ski-ing – I somehow forgot a celebration summit beer – I put my helmet and bike shoes back on and headed down the south side. It’s a long, long, way down to the lake this way. Maybe 25 kilometres (see map at bottom)? 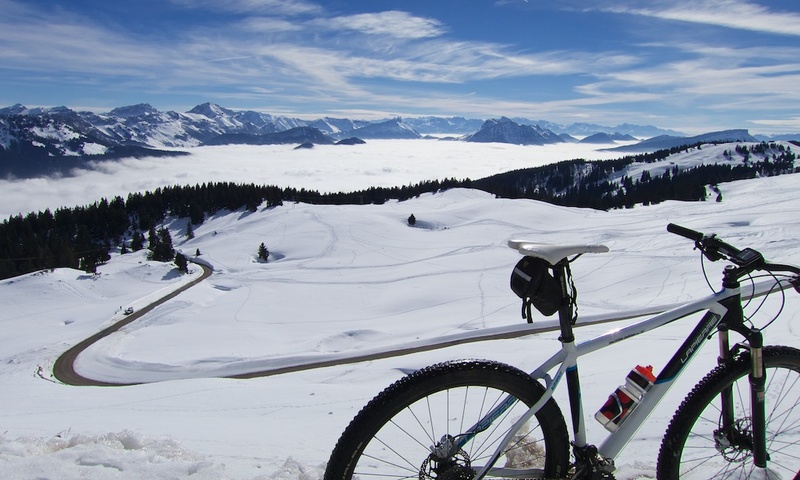 At Col de Leschaux (half way down), I was below the clouds with a frozen face and toes. So I just took the direct way from there – instead of the scenic detour via St-Eustache. At the lake, I rejoined the bike path, headed back to the start, and Bob’s my uncle. Andy, winter cycling here is hit and miss. But when it’s sunny for a few days and the roads dry it can be fantastic. This day the roads were surprisingly fine. I had a mountain bike expecting worse. I was surprised the south side was open ….. this is new … but from my perspective, very welcome. Other climbs nearby in winter? 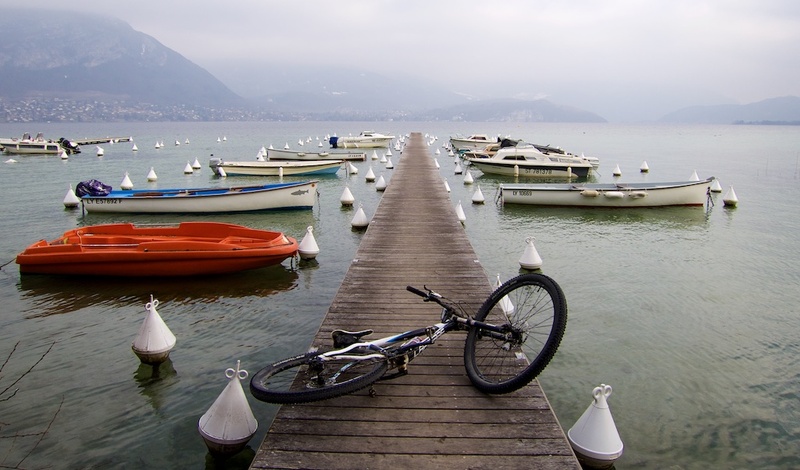 Col de la Forlaz is almost always open, at least one side – this allows the best lake loop. Tamié is probably usually open. 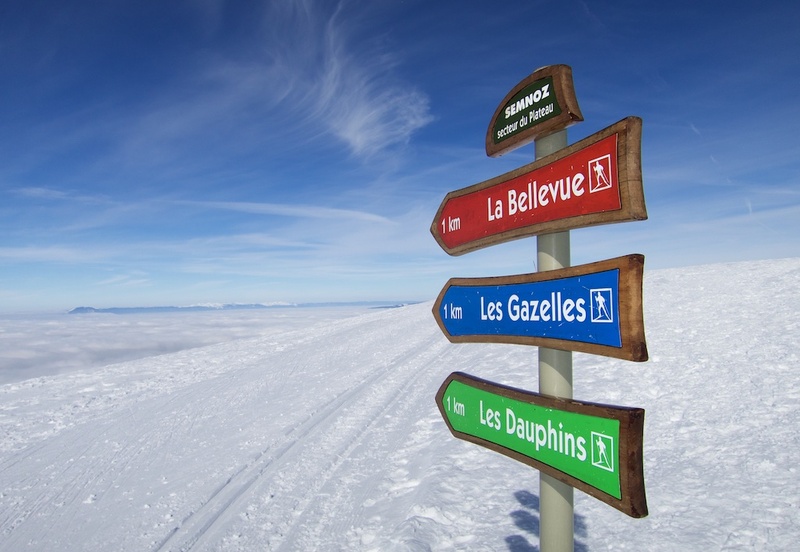 My favourite winter climb nearby is Col de la Croix Fry, which is kept open as skiing at the summit. This can usually be combined with Col des Aravis, also often open. Thanks for the info and for taking time out to reply. I think I’ll keep an eye on the weather forecasts next winter then, and hopefully get a flight out (to Geneva) at the last minute. I rode up to Manigod (after first ascending the Col l’Epine) but ran out of time before making it to the Col de la Croix Fry 🙁 Superb scenery. One final question – if the roads are cleared for skiers does that mean you have to choose your day and time carefully to avoid the traffic? The main traffic watch out for ski stations is Saturday. First, because it’s a weekend. Second, it’s the travel day as most tourists are on a weekly basis with Saturday being the change-over. Alpine roads can be quite congested on Saturdays, especially during the School holiday period – as all of Europe is visiting the Alps. I do want to be a little cautious encouraging you to travel here in winter. It can be dangerously freezing cold on long descents (I’ve worn Sorel boots, balaclava, 6 layers, trying to stay warm). Roads can be treacherous if they haven’t had time to clear. I do less of it than I used to, focusing on Cross Country Skiing and local mountain biking. And I now usually wait for “early spring” for most of the fun snow rides.